The Stannary Brewery Story - From Home Brew to Craft Brew. Laura Clarke, Partner who heads up the Food & Drink Team at WBW Solicitors, recently met with her client, Garry White, one part of the Stannary Brewery crew, to talk about their independent craft brewery based in Tavistock, Devon. L: Tell us about Stannary and where it started? G: Haha… Like all the best ideas Stannary Brewing Company started as a crazy idea over a few beers in a pub about 3 years ago. At the time there wasn’t anywhere this side of Bristol that was selling the big full flavoured beers we loved to drink on away days to London and other major cities so we thought why not start our own brewery and start making the full flavoured hop forward beers we loved. We started out brewing on small 20 litre home brew kits for our own fun and consumption, and then 2 years ago we took the plunge into the commercial brewing world after purchasing a micro-brewery plant off eBay and a couple of months ago we put an order in for a brand new state of the art brew plant which will allow us to make 10 times more beer in each batch than we do at the moment. It’s been a crazy journey since that chat over a few IPAs 3 years ago. L: Out of all of the brews you have ever made, what’s your favourite and why? G: That’s a tough one… We make somewhere in the region of 30 different beers throughout the year. Some are seasonal, some stick around and others are only brewed once a year. At the moment I love our newest pale ale ‘Half Pint Mafia’ it’s got all the big citrusy American hop flavours that I love, we brewed it for the first time this Summer and it’s been the perfect beer for the amazing Summer season we’ve had. G: As a small producer there is a lot of love that goes into our beer and it’s heart-breaking when a beer goes down the drain. It’s the one thing we never get used to but some time’s it has to be done because the taste or quality of the beer is not up to the level we want it to be. Sometimes the beer Gods don’t shine on you and infection can set in or sometimes it’s a case that the flavours just aren’t where we want them to be, but we have always used the rule that if it’s not good enough for us then there is no way its good enough for the people that pay their hard earned cash for it and if it isn’t right then it goes down the drain. L: What has been your proudest moment? G: We’ve had a few proud moments along the way – In the early days it was great just to see our beers and branding in different places and just recently we were the ‘Beer of the Week’ in the Western Morning News beer column with our Vienna Lager ‘Walter’s Lost His Head!’. We’ve always tried to plot little targets along the way to keep us on our toes, not just financial or business targets but also little personal goals and when you achieve those goals it’s a great buzz. For me personally, because Craft Beer is such a small and crazy competitive market I think one of the best feelings is when you see your beers in pubs and bars alongside some of the breweries that inspired us to start up, that gives you a ‘pat on the back’ and the encouragement to keep pushing forward. L: What’s the best bit of feedback you’ve ever had? G: I’m going to name drop now, Adrian Tierney-Jones is one of the world’s most highly regarded beer journalists and beer judges, he helps write the book ‘The Worlds 100 Greatest Beers’ every year and judges at the World Beer Awards. He lives near Exeter and recently sought us out at Exeter Food and Drink Festival and tweeted about our ‘Fantastic’ IPA ‘Hare Trigger’ and wrote a glowing report of our Belgian Saison beer ‘Saison du Soleil’ in his beer magazine, which was a bit of a wow moment for us because Adrian knows his beer! L: What do you love most about your job? G: That’s an easy question to answer… Getting out of the Stannary beer cave and meeting and talking to the people that drink our beers. Food festivals are awesome fun too, we get to have a laugh and a joke with people and we’ve also made some great friends with the other producers. We exhibited at Powderham Food Festival for the first time last year, the organisers and sponsors do an awesome job and the festival really kickstarted our little business, within a few weeks of last year’s festival having talked to people and made some connections Exeter became our main market and now 95% of our beer goes in to Exeter. L: What are your favourite places to eat and drink? G: We are very lucky down here in Devon, we are spoilt for choice and I think that is due to the fantastic produce and awesome small producers we have in the county. For food, I love what the guys from Good Game are doing right now down at the Pig & Pallet in Topsham, it’s rustic, it’s honest and stuffed full of flavour which is pretty much the same approach we have to our beers. Also, this Summer I took my family to lunch at Sharpham Vineyard in Totnes which has some great wine and really good food in a stunning location and they also stock our ‘Reverse Camber IPA’ which is a bit of a bonus! And on the rare occasion that I’m out for a drink then I head to Exeter, Craft Beer is a relatively new concept in Devon but there are some great bars in Exeter that stock some of the best craft beer around, including Stannary beers! You’ve got The Pig & Pickle in Heavitree, In Pursuit of Hoppiness along Longbrook Street (behind John Lewis) and A Little Drop of Poison in Fore Street and you’ve also got Hops & Crafts bottle shop in Fore Street and The Beer Cellar and South Street Standard by the Cathedral, so Exeter is really buzzing for craft beer at the moment. L: What dish best compliments your ales? G: We pretty much make a beer for any occasion. Our Wheat Beer ‘Tokyo Dawn’ goes really well with fish. We use a hop that brings a slight hint of Dill to the beer, try it alongside some fresh mackerel and it really hits the spot. Personally, I love a big hoppy IPA with BBQ’d food they complement each other perfectly. We are lucky that a friend of ours loves his cooking on his BBQ and slow smokes some amazing locally reared meats at the brewery taproom for our monthly open days and it really is a match made in foodie heaven. L: Your beers have some pretty funky names, who comes up with them? G: Haha we always get asked about that. Our beers have real big flavour and each one has it’s own character so they need names to match I guess, but it’s down to the guy that makes the beer to name it, it’s their baby so they deserve to name it. FatHead is the one we are always asked about. ‘FatHead’ is a big 7.4% American Brown Ale we make each Autumn / Winter, it’s the perfect beer to cosy up to on a cold Westcountry night. It kind of made itself by accident, we were experimenting trying to make a black IPA using some of the best American hops we could get at the time but each time we made a test brew this big brown bear of a beer kept coming through and we loved it. A little bit too much one night and when we came in the next day for obvious reasons we named it ‘Fathead’ and the name and the beer stuck around and became a firm favourite. L: What’s the best piece of advice you have received since you started Stannary? G: We’ve made some good friends along the way and had some great advice most of which was given over a beer or two! But the one bit of advice that has always stuck with me is “keep on running, don’t look back, just keep on running”. It was from one of the guys from Verdant Brewing Co down in Falmouth. They also started out as home brewers and are now regarded as one of the best craft brewers on the planet so we’d be silly not to listen to that piece of advice. L: Your advice to anyone venturing into the food and drink sector? G: Be true to yourself and your product. When we first started out we made the beer we thought the market wanted rather than making beer that we loved and in hindsight, it wasn’t the right path to take, for us anyway. Once we started making the beers we loved to drink that love then showed in our finished product. As a small producer, you have to love what you do and love what you make if the product is good and you can stand up proud for it then people will buy into it. 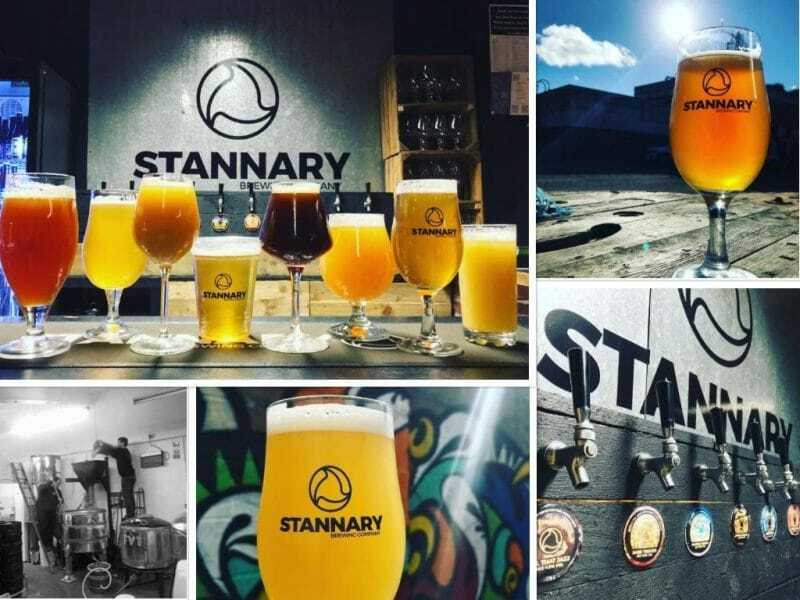 L: So what next for Stannary Brewing Co.? G: We are into the Autumn brewing schedule, the beers will get darker as the nights draw in. We make a great beer with the autumn crop of pumpkins, and have a big Halloween party at the brewery. The big thing for us is getting the new brew plant installed in time for the Christmas trading period and with a bit of luck, you should see a lot more Stannary beer out there before and after Christmas. Hopefully, in 2019 we’ll just keep on running and keep growing. WBW Solicitors have a specialist team, dedicated to the food and drink industry. To arrange a free initial consultation please contact Laura Clarke on 01626 202404.